This afternoon, I trekked out The Natural Gardener to acquire both quality dirt and some better ideas for attracting butterflies to my garden. It’s butterfly migration season in Austin, and all week I’ve been watching butterflies of all kinds fly in confused-looking patterns through my yard, completely ignoring the many verbena, lantana, and salvia varieties I’d planted for them. They even shunned the Gregg’s mistflower I’d transplanted with the certainty that it would be definite butterfly kegger material. So I figured that if I was missing something in my planting scheme, the butterfly garden at The Natural Gardener would clue me in. 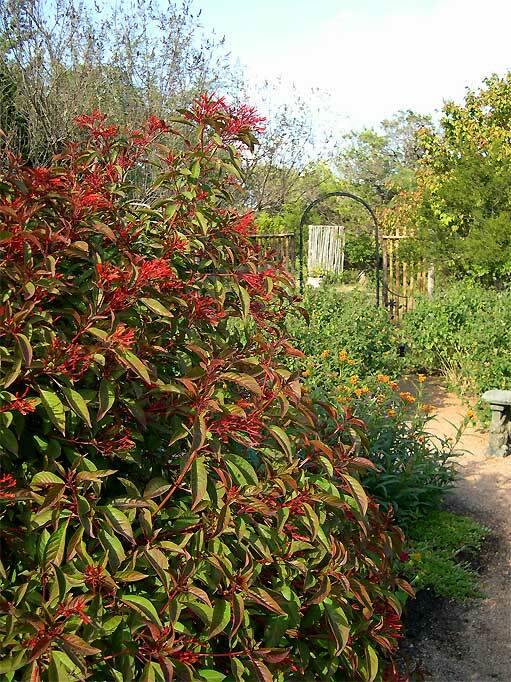 The garden features quite a few fall-blooming butterfly plants, including milkweed, fall aster, pentas, dalea, lantana, firebush, and several different varieties of mistflower. The right fork. I wish I’d taken a closer look so I could ID that yellow flower on the right. 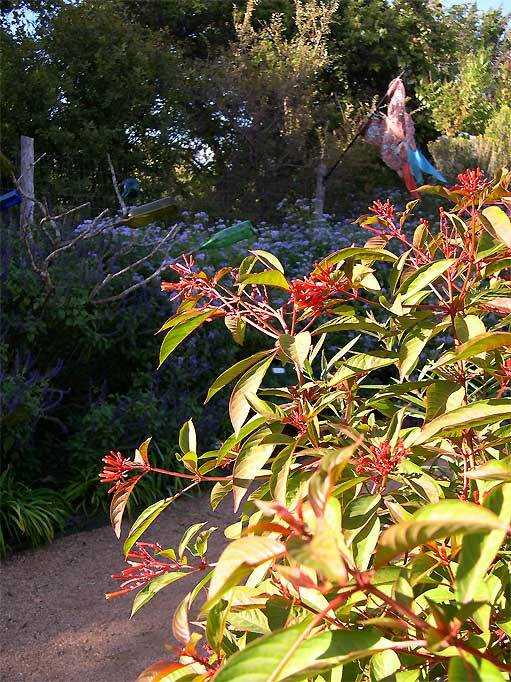 Taking the left fork instead, here are firebush and mistflower, clashing like the butterfly-attracting titans they are! I’m trying to keep to a cool color scheme in my backyard, but I told myself that if I had to plant a garish firebush in the middle of all of the pink and blue to feed some butterflies, I’d grit my teeth and do it. In a neglected corner. But where the bleep are the butterflies? Upon closer inspection, it became apparent this was a completely different variety of mistflower than the one I’ve planted all over my yard. This plant forms a huge, tall, dense bush rather than a groundcover under 18 inches. Browsing through the perennials in the nursery looking for a match, this plant was revealed to be the fragrant native mistflower. This planting of native mistflower was completely covered in butterflies, with butterflies flying a few feet around and above it. I only wish my camera was better so I could have properly captured the spectacle. 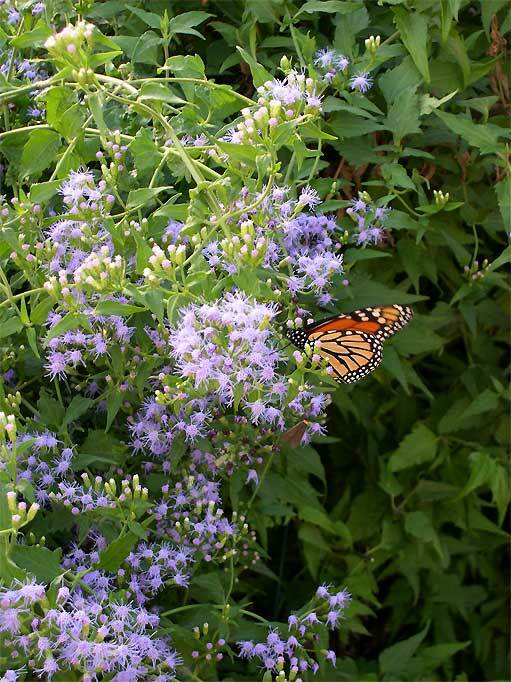 If you look closely, you can see a blur right above the mistflower that’s actually a butterfly in flight. They were a busy bunch, and it took some patience to get a picture where they were in focus. I also noticed that despite there being both native and Gregg’s mistflower in the butterfly garden, the butterflies were ignoring the Gregg’s here too. I grabbed a pot of the white fragrant native mistflower on the way out, and I’m hoping I can make enough room for it to fill in and thrill a decent population of butterflies by next fall. If you have a chance to stop by the butterfly garden over the next week or so, I recommend it. I don’t think I’ve ever seen so many butterflies in one place before, and it made my day. When I was out at the Wildflower Center last month, the butterflies were all over the mistflower as well. I’m confused though: Is Gregg’s mistflower the native one? 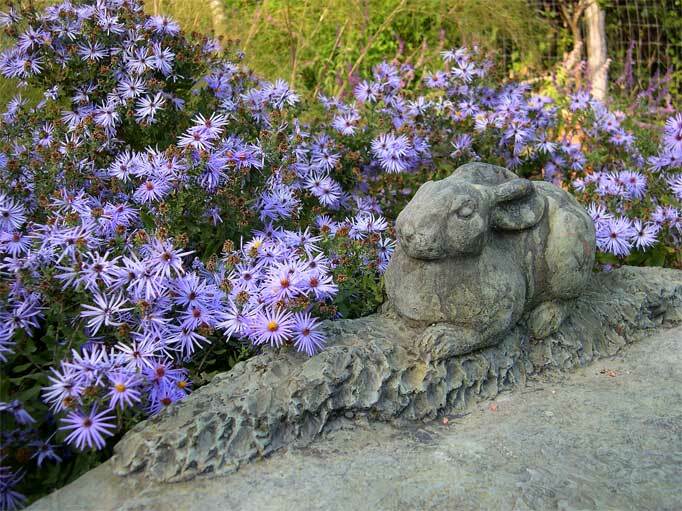 I like the fall aster behind the stone bench with the well behaved bunny. It’s a pretty planting.The fragrant native mist flower looks like it must be the cherry cheesecake of the butterfly world, yummy. Lori, this is an awesome post! I’ve got to get over there and experience that site. I recently purchased a white mistflower from Barton Springs nursery; do you think it’s like the native one you just purchased? Or is there a white Gregg’s as well? I hope it’s like yours! Like you, I plant cool colors (it’s just too hot outside to enjoy look at hot flowers) and don’t have the other butterfly attracting plants. I hope this works! Vertie – According to the Ladybird Johnson Wildflower Center database, both mistflowers are native to the US, and both to parts of TX, though it seems like the “native fragrant mistflower” is the only one that naturally grows on the Edwards Plateau. It’s also part of the aster family, who knew?Northern Shade – When I gardened in WI, fall asters tended to be really weedy and leggy, but I haven’t seen that happen so much down here. I’d really ought to try some, and remember to cut it back in early summer. 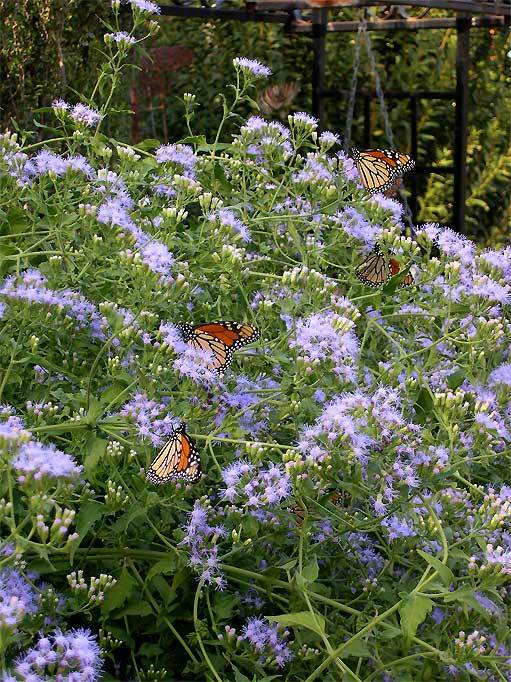 The fragrant native mistflower is the most popular butterfly food I’ve ever seen! 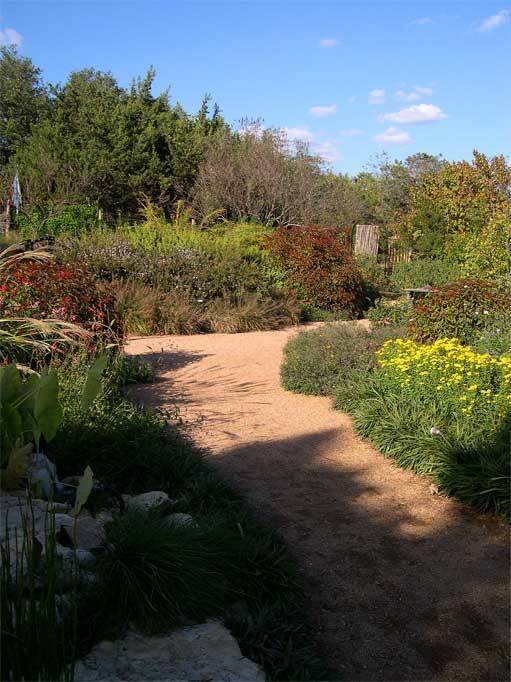 And it smells good, too.Getgrounded – The way you can tell the difference between the native mistflower and the Gregg’s is to look at the leaves. Gregg’s has very bright green cut leaves, and the native fragrant mistflower has darker, duller green leaves like an aster. The plant is also MUCH bigger and woody, since technically it’s a shrub. Annie – I’m dressed as a devil, actually. 😉 I’m probably going to be back at the Natural Gardener tomorrow or Sunday for more compost, so I’ll have to get the actual botanical name of the big mistflower from one of the staff. I love visiting the Natural Gardener. 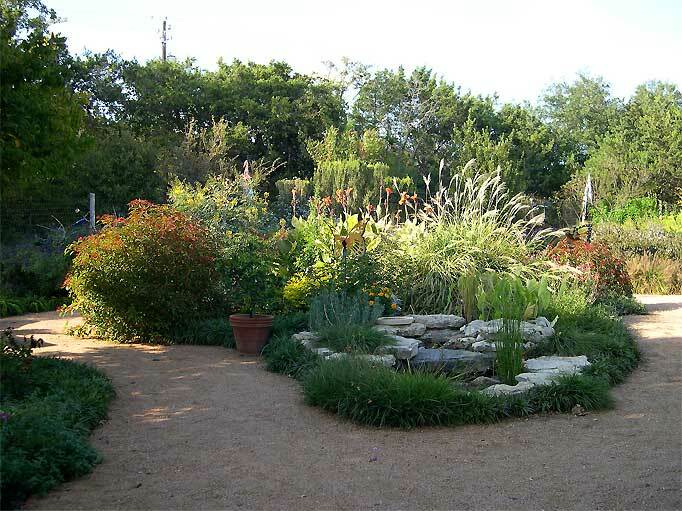 It is like going on a garden tour, there are so many areas to visit. The butterfly garden is wonderful. What a good idea to take the camera along. I have a mistflower that is white but it has suffered badly from the lack of rain this year. My white mist flower is Eupatoriu havanensis also called fragrant mistflower. Of course we all know that common names are confusing and the latin name is the only way to go. Lancashire rose & Annie – I went back to The Natural Gardener yesterday to clarify the botanical name issue, and it just got more confusing. David, the very nice guy I asked about it, said that the mistflower is very rare and not for sale anywhere, and the botanical name is Eupatorium “celest-something.” I did a web search of every variation on “celest-something” I could think of, and nada, zip, zilch. However, David did say that I was free to take as many cuttings as I wanted to try to root them, and also that the mistflower when not cut back for bushiness would reach 8 feet tall, and it also spreads like crazy.And in a grand stroke of irony, The Natural Gardener is now out of every kind of mistflower they had on Thursday except for a few lonely pots of the Gregg's. That bush was really drawing a crowd on Sunday afternoon. 😀Have either of you had any luck rooting cuttings in the past? I'm tempted to take David up on the offer of cuttings, but I'm not sure what to do. Lori; most of the butterflies at my garden are on the Duranta and the little yellow ones and little white ones are on the Tropical Sage, of which is every where. The tall <>Eupatorium<> is almost certainly <>E. odoratum<>, which is a relatively common plant in the lower Rio Grande Valley, where I live. It is a fantastic butterfly magnet, but it only blooms well for a month or so in the fall. A longer-blooming mistflower to consider for butterflies is Betony mistflower, <>Conoclinium betonicifolium<>, if it will grow in your area. I tried Gregg’s this past year, but this supposedly pest-free plant was shredded by moth caterpillars and I never got to see whether it interested the butterflies. This is not like the usual garden you see everyday.. more like the “secret garden”. Looks like I will get lost as soon as I venture inside this garden! wow this garden looks so gorgeous, how the hell you breed black flowers so easily ?